It's impossible to avoid skin aging altogether. That's because the two main causes of aging — time itself and exposure to ultraviolet radiation — are inevitable. However, you can certainly take steps to minimize the damage time and UV radiation cause. Doing so via natural ingredients has been gaining attention over the past few years, and for good reason: Natural ingredients work. Even better, they often do so more effectively than manmade ingredients and with fewer harmful side effects. Researchers have been working hard to keep up with this spike in interest, seeking to evaluate natural ingredients and determine if they truly do work. And if they do work, they're looking for what purposes they're best suited. In one such study, researchers looked at a number of natural products purported to have anti-aging effects. In all, they evaluated plants from a total of 35 families. They found that phytomolecules from polyphenols, triterpenes, and sterols are very promising when it comes to fighting aging. These molecules are particularly great at blocking agents that can harm the skin, such as free radicals. And they're good at preventing trans-epidermal water loss. By keeping collagen healthy and skin hydrated, they help prevent wrinkles and keep skin looking its best. The researchers were really interested in extracts and compounds from the Fabaceae, Asperaceae, and Zingiberaceae families. These include legumes, peas, beans, asters, daisies, sunflowers, and ginger. So keep an eye out for anti-aging products with ingredients derived from these plants in the future. We've already included some of these ingredients, such as sunflower seed oil and a variety of polyphenols, in the Système 41 line of products, and we try to choose natural anti-agers whenever possible. The future of skin care is heading in the direction of natural substances that have been enhanced and captured by science. 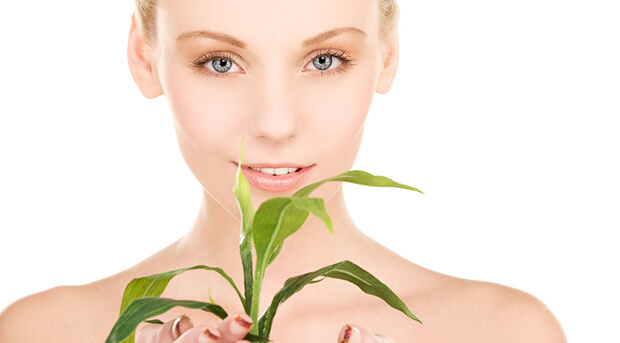 Nature is full of ingredients that can benefit our skin just waiting to be discovered! Tundis R1, Loizzo MR, Bonesi M, Menichini F. “Potential Role of Natural Compounds against Skin Aging.” Curr Med Chem. 2015 Feb 27. [Epub ahead of print].